Double-click the link line between the two tasks. Note: If the link is to an external task, Project opens the file that contains it. Pick a dependency type from the Type list. To get rid of the link entirely, pick (None) from the Type list. 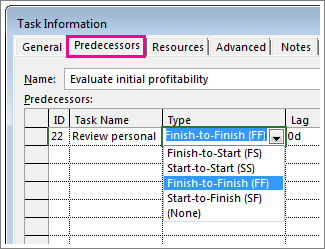 Project management tip Changing a task link doesn’t change where the tasks fall in the hierarchy (outline). To change the hierarchy, indent and outdent tasks to create subtasks and summary tasks. Double-click the Task Name field for the task you want to change. To change a link, pick a link type from the Type column for that link. To delete a link, pick (None) from the Type column. To add a link, click the Task Name field on the first blank row and pick from the list of tasks. Multiple tasks with multiple dependencies can make your Gantt Chart look less like a schedule and more like a tangled knot. You can clean up your view by hiding the link lines. Note: This trick doesn’t remove the dependencies between your tasks. It just hides the lines from view. In the Links section, click the option on the left (the one with no link lines) and then click OK.
It’s easy to confuse task dependencies (links that show a relationship between tasks) with task constraints (restrictions on when a task can start or finish). 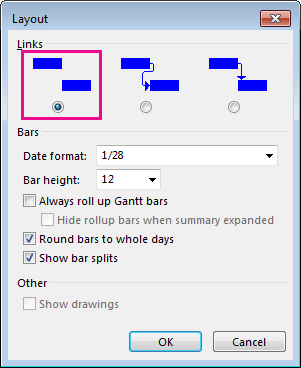 If you’re looking for details on constraints, see Set a task start or finish date.